We now living in the farming country of the Midwest and it is harvest time! I’m forever getting stuck behind tractors as they move from field to field. Corn and beans are being harvested and the farmers market is bursting with wonderful veggies. 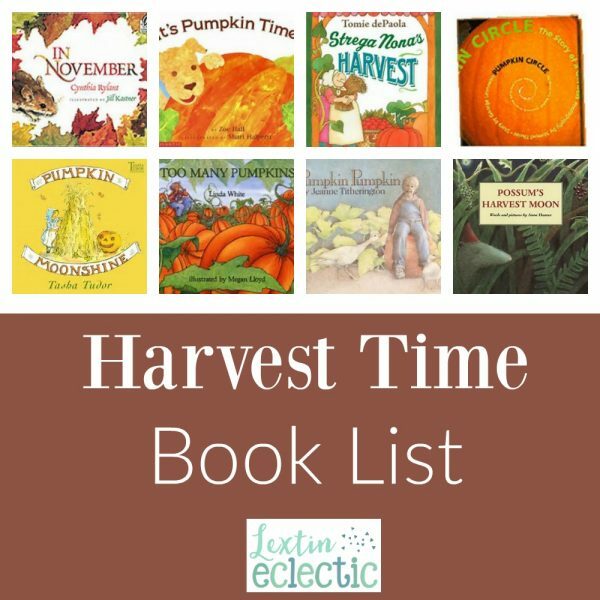 To celebrate harvest time, I put together a book list of a few wonderful picture books to enjoy this time of year. In November, the air grows cold and the earth and all of its creatures prepare for winter. Animals seek food and shelter. And people gather together to celebrate their blessings with family and friends. From seed to pumpkin to seed again – it’s a circle as readers learn about growing a garden and harvesting pumpkins. With countless unwelcome pumpkins to deal with, Rebecca Estelle turns disaster into a celebration. When Possum wakes up one evening and sees the full harvest moon, he decides to throw one last party before the long winter. But everyone is too busy preparing for winter and it looks as if nobody will come to Possum’s party. Strega Nona saves her seeds from last year’s garden, rotates her crops to keep the soil “happy and strong,” and, much to Big Anthony’s chagrin, explains the importance of compost and manure in the planting process. It’s almost Halloween and little Sylvie Ann has found the biggest, fattest pumpkin. But before she can carve it into a giant, crooked-toothed pumpkin moonshine (or jack-o’Iantern), she has to get it home. Fall is here, with all its wonderful visual delights—not just colors, but shapes! Summertime means fresh veggies at the farm stand to pick out and count! Seed, Sprout, Pumpkin, Pie, is a veritable festival of orange featuring the expected (but still satisfying) panoramas of pumpkin fields and market stands. Jamie plants a pumpkin seed in the spring and, after watching it grow all summer, carves a face in it for Halloween! But best of all, he saves some seeds that he will plant again next spring. A brother and sister get an early start on Halloween by planting a pumpkin patch and teach the reader about the process of gardening.